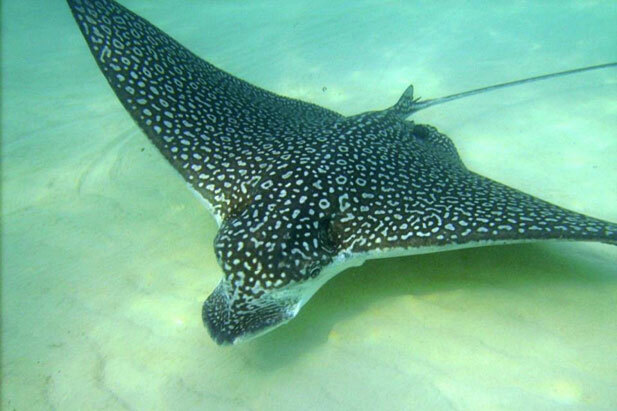 Something fortunately shared by all Dutch Caribbean islands is the ample presence of one of the shark’s distinguished flat cousins: the Spotted Eagle Ray. Whoever witnesses the ray swimming by can hardly help being fascinated by the way it appears to fly through the water with its elegant spotted wings. 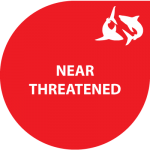 On a global scale, the status of the Eagle Ray is assessed as Near Threatened, mainly because of its vulnerable biological traits. Eagle Rays only have a minor commercial importance in fisheries, but their beautiful look does make it a well-suited species for public aquarium displays and as an attraction for divers. Eagle rays do not pose a threat to humans, as they are shy and generally avoid human contact. Their diet consists mainly of small bristle worms, bivalves, mollusks, squid, cuttlefish, crabs, and fish, and the venomous spines on their incredibly long tail are used for self-defense only. The Spotted Eagle Ray occurs in tropical and warm-temperate waters from the Indo-Pacific to the eastern and western Atlantic. It is usually found from the surface down to a maximum of 60 meters in depth swimming in lagoons, estuaries, and most-often on coral reefs. In open waters, eagle rays form large schools and swim close the surface. Sometimes when pursued, they leap completely out of the water. The species is easily recognized by the spots on its body and its characteristic nose similar to a duck’s bill. It grows up to a length of 2,5 meters, (not including the tail), and a staggering three meters in width. The tail of the eagle ray is longer than any other ray species and has several venomous spines on its base. The species’ biology is still obscure, but we know it reproduces through internal egg-laying and bears a maximum of four pups per litter after a gestation period of around a year. Four pups are considered as relatively many compared to other large ray species such as manta rays. The eagle ray tends to exhibit so-called site fidelity, meaning it often stays within or comes back to the same location. In the Dutch Caribbean, you only find the single Eagle Ray species. However, from looking at physical appearance, coloration, distribution, and parasite composition, scientists recently discovered that the Spotted Eagle Ray may actually consist of four different species complexes, all with according distributions and biological characteristics. But until these complexes can be properly distinguished, Aetobatus narinari is considered a single species.